President Barack Obama showed up ready to rumble on Tuesday night at the Hofstra University. Unfortunately for him, so did Mitt Romney. But Romney had to debate the President and a mediator, who thought she had to pitch in to help out the President if he appeared in trouble. Candy Crowley interrupted Romney 28 times, while she only admonished Obama nine times for exceeding his time. There are analysts that say President Obama scored some debate points. there are others who critiqued Romney for not taking advantage of clear openings to land a knockout blow on Obama. But when the “fog of the debate” clears, polls will show that Mitt Romneyhas picked up more support from the American electorate. After the debate flash polls showed that Obama had an edge in the debate. 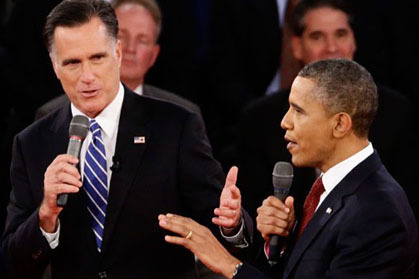 But the question asked was who was the most improved from the Denver debate, of course that was Obama….and who performed close to expectations: Romney. The left leaning CNN poll shortly after the debate, showed Romney had a 58-40 edge on the issue of economics/ best plan for righting our economic ship. President Obama still had a slight edge onMitt Romney when it comes to foreign policy. But ominously for President Obama, the Benghazi attack is becoming a big issue. Additionally it seems, Al Quaeda and terrorism didn’t disappear from the scene when Osama Bin Laden was killed. Another key item that will vex President Obama, is the sky high cost of gasoline plaguing Americans. Last night Mitt Romney was able to lay that blame squarely on the shoulders of Obamaslast four years of energy policy. Political scientist Frank Luntz monitored a panel of 21 voters, many of whom previously voted for Obama in 2008. After the debate, a majority of them said they will be voting for Romney. Romney’s popularity in the national polls is making a difference in swing states formerly assumed to be President Obama’s. They are now very close or leaning Romney. Pundits might say they give the edge to Obama in points in this last debate, but the points that really matter to Americans all belong to Mitt Romney.